I’m in the odd situation, with the next two Penguin Moderns in my sequential read of the box set, of coming across two books containing works I’ve already previously read. The Russian PM I bought separately in advance of the box coming my way, as I love Gazdanov’s work so much, and it also served as a taster for a collection of his short stories; and the Calvino stories are drawn from one of my favourite collections of his work, “The Complete Cosmicomics”. Both have been reviewed here on the Ramblings, but as these are two favourite authors I was more than happy to revisit them! As I’ve probably mentioned before, Gazdanov is a recent discovery by me, thanks to the wonderful translations by Bryan Karetnyk which have been issued by the lovely Pushkin Press. I’ve read each one they’ve put out, and his writing is just marvellous. The four stories here, by Gazdanov, Nina Berberova, Yuri Felsen and Galina Kuznetsova, are all translated by Karetnyk and three of them featured in his wonderful anthology “Russian Emigre Short Stories from Bunin to Yanovsky”. Revisiting the stories hasn’t changed my mind about the quality of the writing here; and as well as picking up PM21 for the marvellous uncollected story, I also of course still highly recommend the émigré collection! Ah, Calvino! I have had a major obsession with his work for a good chunk of my life which has never really gone away, ever since I was pointed in the direction of “If on a winter’s night a traveler…” back in the early 1980s. It would be one of my desert island books, as would be his “Complete Cosmicomics”. Both of these are books I’ve revisited on the blog, “Traveler…” here and “Cosmicomics…” here. The PM draws four stories from the collection: the title story (which is one of my favourites), Without Colours, As Long as the Sun Lasts and Implosion. All of these are titles I wanted to read anyway, and I don’t mind having extra copies. But in advance of a review I have going live on Thursday, I thought I would dip into the Four Russian Short Stories volume. These are all works by émigré writers and it’s interesting that of the four featured, it’s the name of Gaito Gazdanov that appears on the cover; testament, I suppose, to the success of Pushkin Press’s rediscovery of his work over recent years. The stories are translated by the ever-industrious Bryan Karetnyk, who was responsible for the marvellous “Russian Emigre Short Stories from Bunin to Yanovsky”, which I reviewed for Shiny New Books. Three of the stories featured here are also in that book, but very excitingly this little volume features a newly translated gem in the form of “A Miracle” by Yury Felsen. First published in 1934, this evocative story is set in a clinic where the narrator is bored whilst recuperating. Forced into the company of a rather troubling nurse, he is initially relieved to have a room-mate, although the latter turns out to be taciturn and no company at all. However, on the room-mate’s day of discharge a few home truths are told and the final denouement is perhaps unexpected. I read this story after finishing my Thursday book and interestingly found that it resonated strongly with the feelings I had about that particular volume. Specifically, I keep returning to the drifting quality of émigré life, the detachment of the protagonists, and their sense of ennui as well as often despair. There will be more on this subject in Thursday’s post, but if you want an introduction to Russian émigré writing this is definitely a great place to start. One of the things which please me about the “Russian Emigre…” volume was the gender balance and the fact that there were a goodly number of women writers featured; I’m glad to see that this has been carried over to PM21 as there is a 50:50 split. As well as Gazdanov and Felsen, the other stories are by Nina Berberova and Galina Kuznetsova, and all are excellent. I’ll leave you a quote from Gazdanov which will give you an idea of the quality of the writing here – more émigré writing to come later this week! The February dusk fell, plunging Paris into the icy darkness typical of this time of year, and night shrouded everything that had just taken place. Afterwards, it began to seem as if none of this had ever happened, as if it had all been an apparition, eternity’s brief intrusion into the historical reality in which we just happened to live, uttering foreign words in a foreign tongue, not knowing where we were headed, having forgotten whence we came. As well as bringing us lots of lovely Stefan Zweig books, Pushkin Press have also done fans of Russian authors a great service with their lovely translations of Gaito Gazdanov’s novels. I’ve written about several on the Ramblings, hypnotised by his wonderful prose and dreamlike narratives; so I was very excited to see that Pushkin were bringing out another Gazdanov title, and they were kind enough to provide a review copy. “The Flight” was Gazdanov’s third novel, written in 1939, but not published in its first complete edition until 1992. Set in the émigré world of the 1930s, it tells the story of the interlinking lives of a disparate group of characters. There is Sergey Sergeyevich, a millionaire ex pat, who seems to display no emotions and has a public, mask-like persona. His wife, Olga Alexandrovna staggers from one affair to another, constantly walking out on him and then returning when all goes wrong. Also on the scene is her sister Liza, who just happens to be the mistress of Sergey Sergeyevich and also of her nephew, his son Seryozha! Then there are the slightly more peripheral characters: Lola Ainee, an ageing actress with a gigolo husband, who sponges from Sergey; Yegorkin, a penniless painter who’s another one dependent on Sergey’s good nature; Sletov, Sergey Sergeyevich’s old friend who’s permanently suffering from the fall-out of his latest love affair and regularly washes up to cry on his comrade’s shoulder. The final pair in the mix are Arkady Alexandrovich, an author and his wife Lyudmilla; Arkady is Olga Alexandrovna’s latest love, but it appears that he might be a more permanent fixture in her life. And as Lyudmilla is in love with a rich Englishman and desperate for a divorce, it seems that Sergey Sergeyevich’s comfortable regime may be about to crumble. They all flit from Paris to London to the Midi and back again; and their main problems in life revolve around love and money, those old perennials! The central core of the story is Sergey Sergeyevich; he’s a man who’s been through many dramatic experiences, as we learn, in his flight from the Russian Civil War, and yet he’s managed to come through it all apparently untouched. Yet the mask is always present, and there is the suspicion that his lack of real emotion and total control hides an interior self we’ll never see. In many ways, the rest of the characters orbit him; the two sisters who are in effect his love life are dependent on him and yet somehow despise him; his son, for who he’s an elusive figure, coming and going through his younger life depending on the whims of Olga Alexandrovna; Sletov and Yegorkin, who rely on his charity, but are both clear-eyed enough to see his faults. The book’s publicity makes much of the element of Liza and Seryozha’s secret and somewhat forbidden love, and this is quite a striking and perhaps alarming turn of events; only when Seryozha starts to think clearly of Liza in terms of her being his mother’s sister do we really get a sense of how the two are transgressing. Add into this the age difference, as well as the long relationship between Liza and Seryozha’s father, and it really does all seem quite scandalous. As the narrative progresses and the tale starts to take flight, the interlinked destinies of all the characters start to draw together. There are a series of dramatic events as matters come to a head; secrets are revealed, lovers are separated and reunited, and many of the characters make a desperate attempt to grasp happiness. As for the title, you might be wondering what it refers to… Well, there’s mention of the flight of life itself; several of the characters have taken flight from their partners and their normal life; and others are in flight from poverty or their past. However, all will be revealed by the stunning ending. I’ve previously been mesmerised by Gazdanov’s slightly surreal, fanciful and complex works; however “The Flight” is a completely different kettle of fish! This is Gazdanov in playful mood, spinning a tale of emigres and their romances, dysfunctional families and lost loves. However, look closer and you can see a darker, satirical side to the book. The high life and the glossy facade are in the end worthless, and it takes Sletov to see that Sergey Sergeyevich is suffering from a lack of real emotion – which becomes clear to the latter towards the end of the story. About the resolution I will say little… For “The Flight was one of those novels which had me careering headlong to the end of the tale, totally gripped by the events and storytelling; and when I *had* got to the end I felt I instantly wanted to go back to the beginning and read it all over again, just to be able to appreciate it even more without needing to find out what happened to the characters. Gazdanov’s writing and plotting are magnificent, and the book is again beautifully translated by Bryan Karetnyk (who also did the two previous Pushkin Gazdanovs) and he’s quite obviously the man for the job! “The Flight” is one of my stand-out reads of the year so far. Really I can’t thank Pushkin Press enough – not only for bringing Gazdanov back into general circulation, but also for the ongoing loveliness of their books! If you’ve been considering reading GG (and I really think you should!) but are perhaps uncertain about the dreamlike narratives of his other novels, “The Flight” would be a great place to start – it’s a wonderful, wonderful book and highly recommended! It’s funny how publishing fashions and favourite books go in phases; some authors are read consistently, whereas others dip in and out of the public eye, until it takes a big push by a publisher to bring them back into the book arena. Gaito Gazdanov is very much one of those writers. 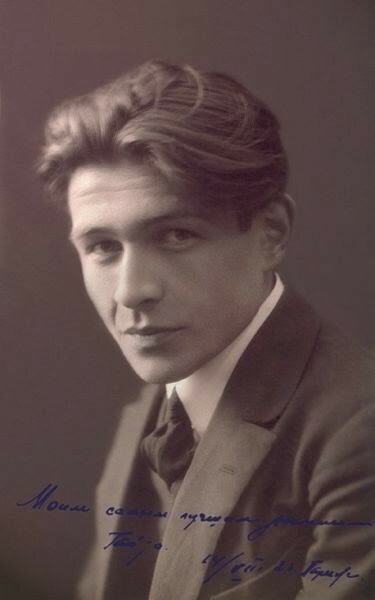 He had a varied and fascinating life and career, surviving revolution and civil war in Russia, escaping into exile and ending up in Paris where he joined the émigré life. Here, he split his time between earning a living as a night-time taxi drive and writing his wonderful fictions. They were published and translated and earned much praise from authors such as Gorky, and Gazdanov went on to do have quite a life, including broadcasting on Radio Liberty (and you can actually hear his voice online here – thanks to Pushkin Press for pointing this out). And yet in recent years he’s been something of an unsung writer – certainly, despite my extensive Russian reading, I hadn’t come across him until Pushkin started issuing his works, starting with “The Spectre of Alexander Wolf” and soon to come “The Buddha’s Return”, which I’ve reviewed for the forthcoming edition of Shiny New Books. 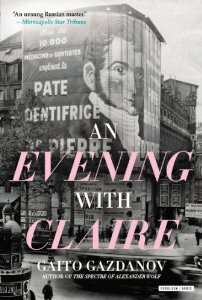 However, Pushkin Press are not the only publishers to be promoting Gazdanov, as the Overlook Press/Ardis in the USA put out this year his first novel “An Evening with Claire”. Originally published in 1930, this was the work that brought him to the attention of his fellow writers, and it’s easy to see why it was such a hit with émigré Russians in particular. The novel opens with the narrator, Kolya, spending the eponymous evening with Claire. Her husband is away and it’s obvious from what he says that he has been in love with her for years. However, they seem to be constantly misunderstanding each other and the reader is left to wonder whether this is a relationship that has any kind of future, and why the two are drawn together. As the night wears on, Kolya begins to remember his past. Journeying back in his mind, he recalls his childhood, growing up with his mother and father in Siberia; his days at school; the death of his father; the coming of the War, then Revolution and Civil War; and finally his escape to a new life. So in many ways plot is not the main element in this book. Instead, we see the internal life of Kolya, his emotions (or lack of them), the world through his eyes and the changes he lives through. In particular, the second half of the book, focussing as it does on the chaos and confusion of the Civil War, is extremely powerful and effective. Kolya joins up against his family’s wishes – his mother is distraught, his Uncle Vitaly angry – and in many ways passes through the fighting unscathed. All the way through the book he has had a strong inner life into which he retreats, and in many ways this tends to shield him from the harsh realities of conflict – and they are here, but Kolya seems able to almost ignore them. As the upper hand switches from one side to the other, and the Red finally seem to be winning, Kolya reaches Sevastopol – literally the end of the road, and the only option is to head away from Russia on a boat. “Claire” is like and unlike Gazdanov’s other books: stylistically, you know you’re reading the same writer, with his beautiful, elegiac prose. However, the subject matter is very autobiographical (and the excellent introduction to this edition by translator Jodi Daynard discusses this element) , and there is an immediacy to the book where you feel you’re living through events alongside Kolya/Gaito, in a kind of haze of experience. Comparisons have been made to Proust, in the importance of memory in Gazdanov’s work; I’d certainly agree that it’s a strong part of his writing, but not the only one. He has a particular view of the world, slightly detached, fantastic even in some of his writings; it’s very individual and often leads to him blurring the lines between the real and the imagined which is fascinating. The novel also captures strongly what it was like to live through the last days of the Russian empire, as Kolya’s family and friends carry on as normally as they can with the world collapsing around them. As we learn how Kolya and Claire met, as we witness his frequent inability to grasp reality or understand what is going on around, we get a view inside the mind of a man who witnesses and survived remarkable events, and went on to use them in his fictions. In the late 1940s/early 1950s he was still referring to these events in his work, which is not surprising – living though a cataclysm at an early age is going to leave its mark. Gasdanov’s fiction is unique – his prose is hypnotic and compelling, his storytelling masterful and his ability to evoke place, character and atmosphere is excellent. I only wish I had discovered his work sooner; however, I should give myself a slapping, because had I read the Nabokov short story “Torpid Smoke”, first published in 1932, I would have come across reference to this wonderful book. The excellent Russian Dinosaur blog recently featured an interview with Bryan Karetnyk, translator of the Gazdanov/Pushkin volumes. This was fascinating reading in its own right, but even more so because Karetnyk remarked that he had heard mention of Gazdanov in this early Nabokov tale – it seems that the latter was well aware of the former and thought him worthy of mention alongside Pasternak and Ilf & Petrov, amongst others! And I’d agree – Gazdanov is a quirky, individual and wonderfully talented author and I’m pleased to hear that there’s likely to be more of his writing appearing in English (and there’s a short story you can read here) – so yay for translators and their publishers! On a minor aside, much as I adored “Claire” and kudos to Overlook for publishing it, I really have to say that it would have benefited from some much tighter proof reading. Apart from several examples of split words, often names (Bu nin instead of Bunin; Eliza veta instead of Elizaveta), there were some silly mistakes that should have been picked up – for example unless “pouring over a book” is a new Americanism I’ve not heard, it really should be “poring”!